Includes 5 games (Tangram, Words, Numbers, Masterpiece and Newton) Compatible with iPad 2/3/4, iPad Mini/2/3/4, iPad Air/Air 2, iPad 9.7" and iPad Pro 9.7"
Osmo provides a unique gaming accessory that will change the way your child plays. 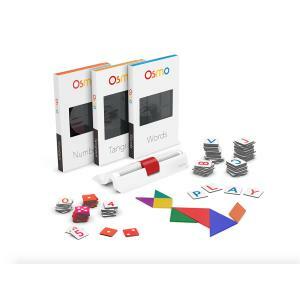 The Osmo Genius Kit offers an expansive collection of Osmo games that will allow children to explore science, math, art, encourages visual thinking and so much more in a playful hands-on way. Crafted with reflective artificial intelligence, Osmo offers a ground-breaking technology that bridges the real and digital realms. Through experimentation in a stress-free environment and real-time feedback, kids learn that there are multiple good ways to solve a problem. Math and other subjects in turn will becomes creative and fun. The Genius Kit is perfect for kids age 5-12 years old, but really is designed for all ages. With counting-addition-multiplication modes, blending real-life doodles with on-screen action, kick-starting creativity and problem solving, there is a challenge for everybody. This complete set fosters learning in key areas such as creative problem solving, art, STEM (science, technology, engineering and mathematics) and common core. All five games are an irresistible invitation to imagine, invent, explore, and play.